Other than 黒門市場 Kuromon Market and 道頓堀 Dotomburi, we had no idea what else we wanted to do in 大阪 Osaka, and so had only planned for a one night stay in 大阪 Osaka, mainly because it was easier to catch our 11:00 flight at 関西空港 Kansai Airport. That was when Ms V found out that there was Wizarding World of Harry Potter (WWHP) in Universal Studio Japan (USJ), that launched in 2014. To go, or not to go? We had read all about the crazy crowds in the morning awaiting opening, super long queues for rides, food and merchandise, and timed ticket entry to WWHP, with some getting lousy timings despite having the express tickets. Imagine paying ¥7200 for the 1 day pass (including tax), and an additional minimum of ¥5200 Universal Express® Pass 5 (The Pass 3 did not include the Harry Potter and the Forbidden Journey™ ride, which was apparently the must-do), and getting a 17:30 timing to enter and do the ride… That would be almost S$150 into the drain, and there was still the must-drink butter beer, and wouldn’t you want to get at least one souvenir home? We also read about how Hogwarts castle looked different in the day and night, and how we would never want to get out. I was not sure if I would be able to handle a day of queueing though, and I had never been to Disneyland or Universal Studio, unless I count the walk-through during the New Paper Big Walk many years ago. I did enjoy the movies and books, but definitely not as big a fan as Ms V. Hubby did not even read the books, and barely completed the shows. However, if we did not go this round, we were unlikely to have a chance any time soon. 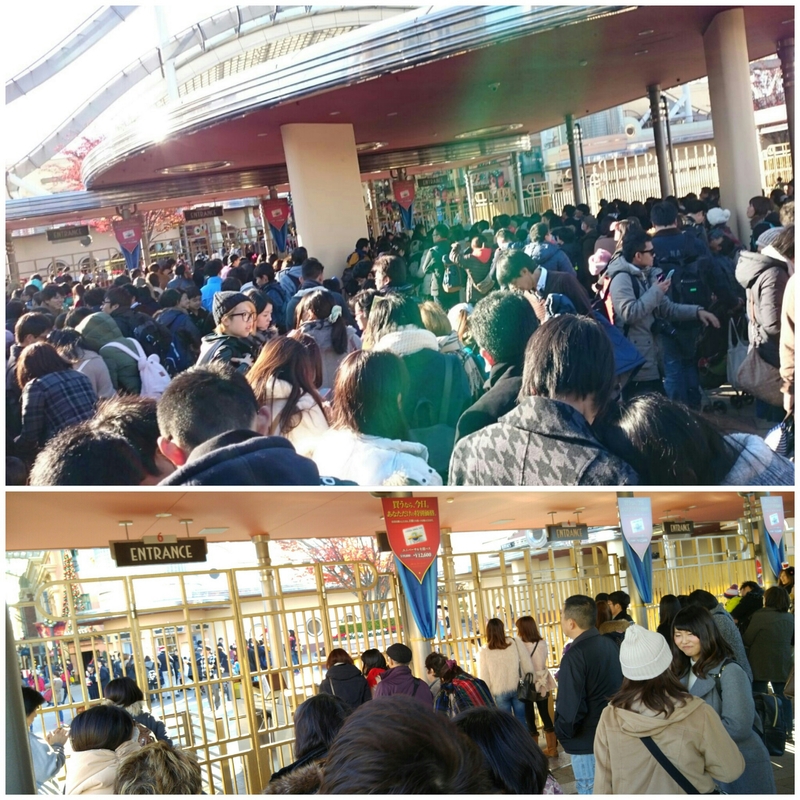 While we were contemplating how best to do it, we kept browsing for new reviews, and we noticed that the queues seemed to have let up a little, and there was this mystery discount ticket for after-15:00 entry to USJ, and someone said that with this discount ticket, he still managed to get a timed ticket for WWHP. That idea got me sold; I could probably survive 5 hours in a theme park, and I get to split the day between hubby and good friend… This is called win-win situation, haha! Thankfully, I had my M1 data passport activated, and it was working very well. Armed with a power bank and having my phone browser set at the Hyperdia page, I was pretty confident of figuring my way out… So yes, we girls made it safe and sound to Universal City at 14:35. Don’t you just love the trains in Japan and their timeliness? We made it easily to the ticket counters (no queue, yeah!) and discovered that this discount ticket was known as the Christmas Twilight Pass, and cost ¥5800 per adult, including tax. I think this ticket, like the full day passes, do not run out, so there is no need for advance purchase. We were directed to specific gates to wait for the 15:00 entry. The queue was fairly short, and everyone was queuing in a very orderly manner. Guess not many people bought the discounted tickets, because Ms F had sent me a picture of the crazy crowds earlier this morning! The 10-minute wait reached a climax when the staff started appearing, waving and smiling at everybody, and getting us to say “こんにちわ” (“konnichiwa”, aka “good afternoon”), and we were let through the gates fairly efficiently. We wanted to go straight to WWHP, but got lost… hahaha! So we approached a staff, and after much sign language, we managed to find the place to get the timed tickets (it’s near Jaws), and again, no queue, and wow, we got the 15:20 entry! So we just continued our path to the entrance… The sign board said that it was admitting people with 15:10 tickets, but the staff let us through anyway (it was actually 15:20 on my watch). By now, we totally agree with the many online reviews that said that the staff hardly spoke English. We were directed here, there, everywhere, until we found an English-speaking staff who directed us to the correct queue for the HP ride… Gosh! However, each staff was just bursting with enthusiasm and energy, making us feel very excited! We had initially wanted to join the single rider’s queue, which we read that it was actually the same as the express queue, but we would not be able to take the ride together. However, we also read that the single rider queue meant that we would miss out the “pre-ride experience”, and so, we decided to just join the normal, non-express queue, which was probably our biggest mistake of this trip. The queue for the ride was estimated to be 160 minutes, and we queued almost 2 hours for the ride… I don’t think I had ever queued so long for food. Most of the queue was outside the castle, which meant that there was not that much to see, and we were thankful that we had each other’s company. Once we reached the castle, the queue moved really quickly, and there was not much time to take in the sights, much less for photo-taking. We had to dump our belongings into a locker, and we were issued 3D glasses and got into a 4-seater for the ride. Ms V totally enjoyed the ride! It felt very real, and you feel like you were literally flying! What an exhilarating ride! By the time we came out, the estimated waiting time for the ride was down to 40 minutes. When we got out of the shop, we caught the choir with croaking frogs 😛 Oh, and we also visited the ladies to hear Moaning Myrtle speak in Japanese, haha! Around 18.30, there was no queue at the Three Broomsticks, so we decided to have our butter beers there. 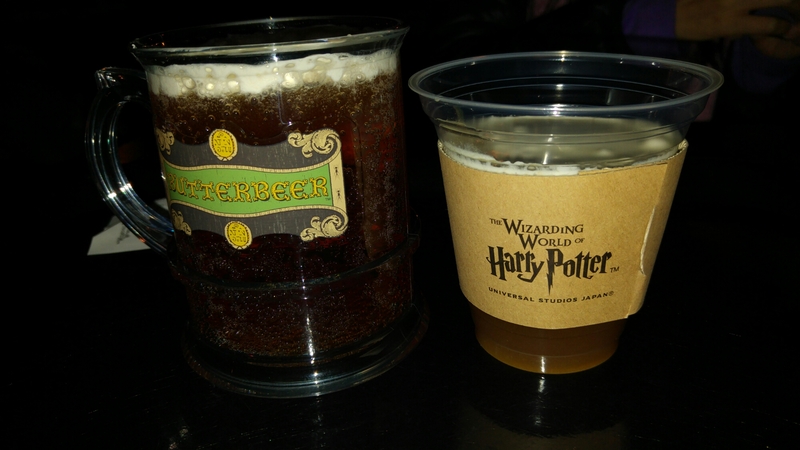 Not wanting to have any regrets, we tried both the hot and cold butter beer (¥700 vs ¥600, and an additional ¥500 if you wanted the souvenir mug). We definitely preferred the cold version. The seaonal hot version was way too sweet, because of the cream that was meant for the froth effect melted into the drink… Since it was not crowded, we chilled for 30 minutes or so, enjoying the various projections off different sides of the walls. We gotta admit that there was a lot of thought and efforts put in to make the entire WWHP really as real and as magical as possible! We spent the remaining time checking out the various shops, and also went for the Ollivanders’ show, where this lucky little girl was the chosen one. 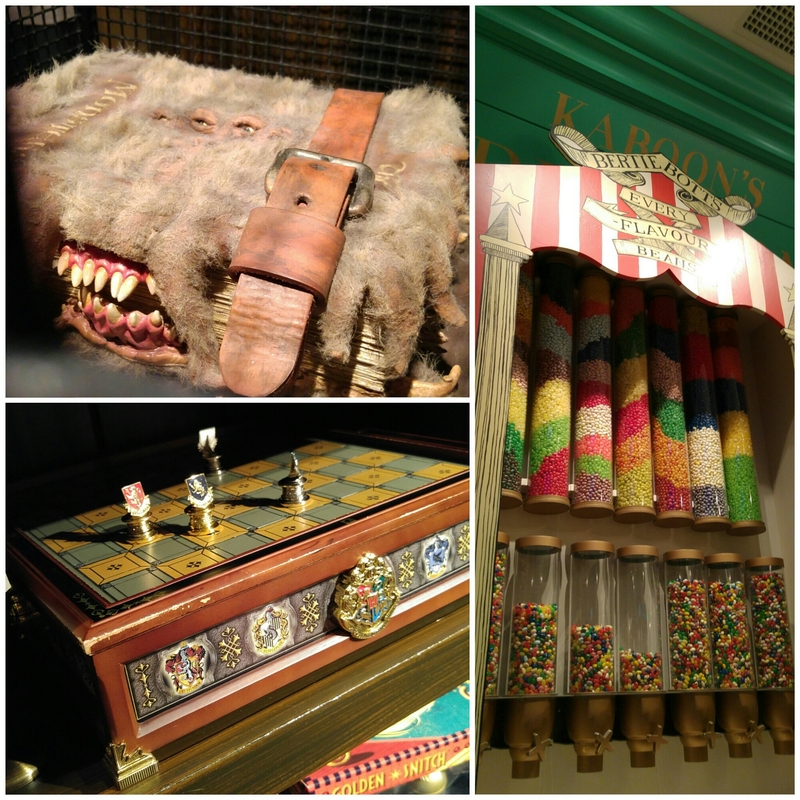 We loved the details they put into the creation of each wand! We noticed that some of the shops carry similar items, but there were always a few items unique to each shop. I was extremely glad that we had stayed on. 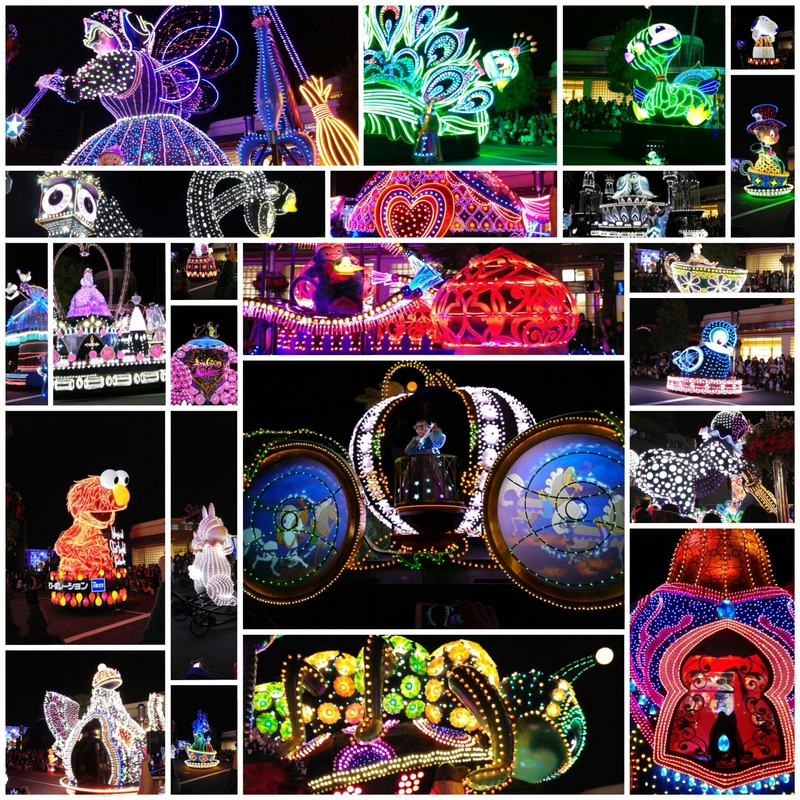 The 20-minute parade was absolutely fabulous and added that oh-so-magical ending to our trip. I read your blog before I went to USJ. I wonder if Moaning Myrtle was also present in the men’s restroom haha! Thank you very much for your blog. So much has changed since you last went, the price for USJ ticket is now 7,400 yen 😦 Super expensive, and I guess I will consider getting the half day pass to save bunch of money and go on a Single Ride for shorter queue. By the way, I wrote a blog post on how to buy tickets without lining up at the entrance gates. If you’re interested in reading, here it is: Where to Buy Universal Studios Japan (USJ) Tickets. Hope you find it helpful.